That song has always made me hungry. And today is the absolute perfect day to indulge. 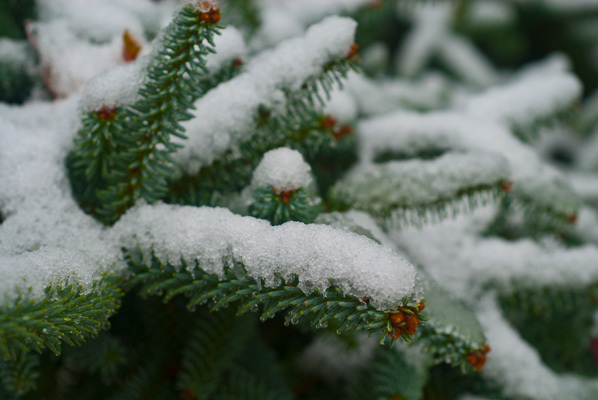 The first snow of the season started yesterday afternoon, and being in North Vancouver, we were among the first to get it. I love the fact that we are a city known for going absolutely verklempt when it snows. Things shut down, people refuse to drive (no bad thing, for some of ‘em). We, the same people who adore snow up the mountains, and would rather ski than eat, are paralyzed by the white stuff lying in the driveway. Everything slows down, and it is my perfect excuse to put off things – “better do that when the snow stops” – and stare up at the sky. I love the gently falling flakes, which come down so softly compared to the rain. I love the way kids and adults alike run out into the snow, to catch it while they can, instead of scuttling inside. I love diving through the Deacon’s bench to find my ridiculous Eeyore Hat, complete with floppy ears and snout (the perfect length for keeping the snow out of my eyes). I love finding my big oversized moose sweater, and the rainbow myriad of scarves, reflecting generations of family knitters. I love stepping outside, gulping in fresh cold air, and wiggling my toes inside my hiking boots. And when I feel the chill creeping into my extremities, one of the comforts I most look forward to, is wrapping my frozen fingers around a mug of hot chocolate. It, more than any other drink, seems to celebrate and guard against the cold of winter. And I am not talking about any insipid, from a package, made with not-hot-enough water, faux hot chocolate (I drank enough of that on Cubs and Beavers Night Hikes) – I mean the full on, full fat, rich and deliciously creamy drinking chocolate. Yes, I know the Mayans didn’t use cream, and no, they didn’t heat it up, but they didn’t live in a cold climate, and since I am not likely to get to the Yucatan Peninsula any time soon, I am going to make sure mine is steaming. First step this morning, however, is to make the marshmallows which will adorn the drinking chocolate. I wish the boys a good morning at “the temple of higher learning” (it really bugs them when I say that) watch with satisfaction as they actually put tuques on their heads and slouch out the door. They are not happy at the thought that tomorrow, Saturday, it will probably snow enough to warrant a school closure. Monday’s forecast is for sun. It is just not fair. They clearly need a treat. 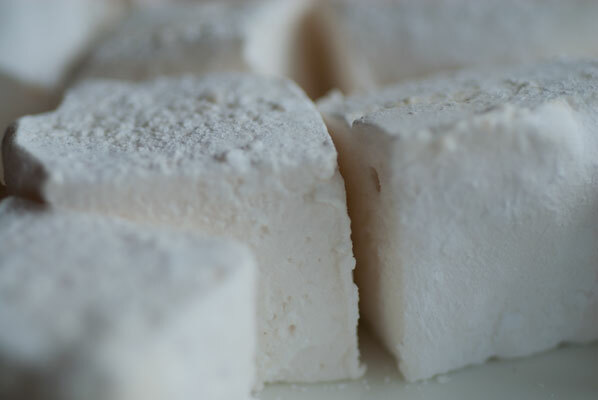 It looks pretty marshmallow-y outside at the moment, and after a brisk walk in the canyon, I am ready to make ‘em. 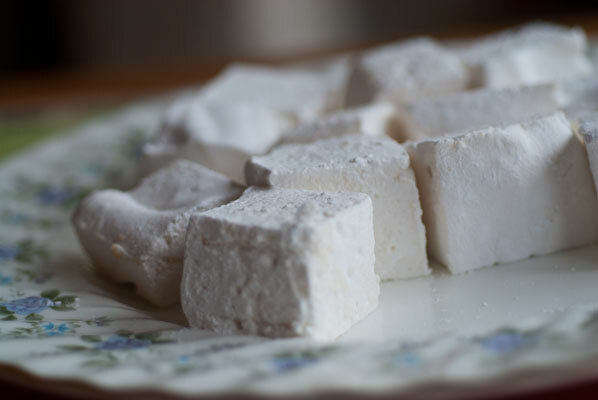 My last couple of efforts at making marshmallows have been less than stellar, and I am happy when I find a link to Smitten Kitchen’s recipe for Springy Fluffy Marshmallows, an adaptation of a recipe from Gourmet magazine, December 1998. I notice that this recipe has beaten egg whites added to it, before removing to the pan, and wonder if this will make things even more challenging, as marshmallow making can turn a whole kitchen into a sticky mess. The egg whites are meant to make the texture lighter, so I give them a go. This is an excellent recipe, as it turns out, and will definitely be my go-to for marshmallows of the future. I would like to try substituting meringue powder for the egg whites, and perhaps agar powder for the gelatine, so my vegetarian friends can eat them, but these are delicious, with a light springy texture, not dense or cloyingly sweet. I cannot wait to try them in a cup of chocolate. They are also much easier to transfer from mixer to pan, and set up in a matter of a couple of hours – a great thing about a cold day. Now, for the drinking chocolate. I almost feel as though I should go out for another walk, to deserve the richness of this beverage, which, apparently, some North Americans find disgusting. Chocolate and cream disgusting? Ah well, to each their own. This beverage is meant to be sipped slowly, not quaffed, from tiny cups. Much like you sip an espresso, as compared knocking back a Tim Hortons Double Double. 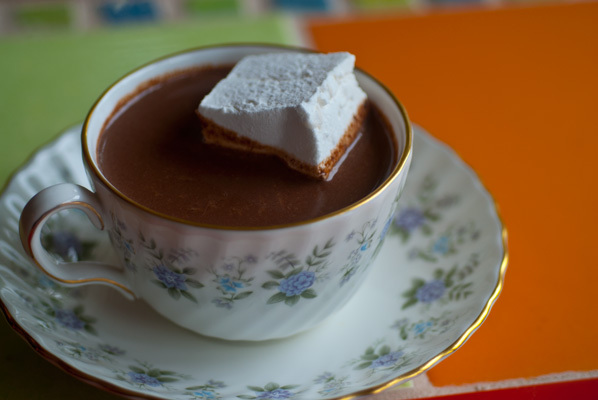 Pour into your best fancy teacup, and gently lower in a marshmallow. Enjoy. Oh gosh, this is so good. 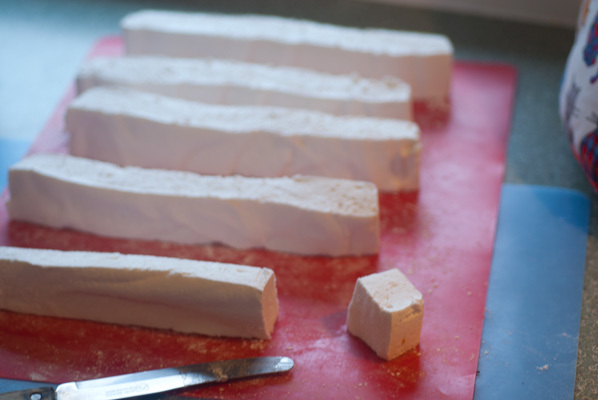 The marshmallow melts beautifully and spreads itself over the surface, but is sturdy enough to withstand being rolled over and over, until it is coated with chocolate. You really can’t drink this too quickly. It is like a rich dessert, and my husband enjoys his with a palate cleansing glass of water. As I am sipping this lovely dark concoction, it occurs to me that this is really like drinking a ganache. And then I have a light bulb moment. I have some milk chocolate ganache infused with coffee, cinnamon and vanilla in the refrigerator, at this very moment, featured in a post on infusions, from a few weeks ago. I froze the squares of ganache in silicon molds, because I honestly hadn’t figured out what to use them for – until now. I took them out of the freezer yesterday, and they are residing on the lower shelf of the refrigerator, awaiting my attention. I keep snitching them, in my weaker moments, so it would be good to apply them to a purpose, before I simply eat them all. 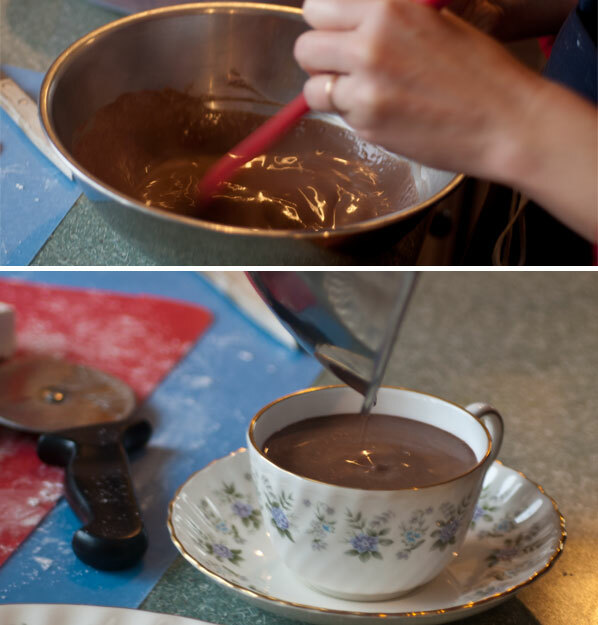 I retrieve the ganache squares, heat a small cup of 1% milk, and whisk four of squares together with the hot milk. The resulting drink is smooth, sweet and much closer in consistency to a cup of hot cocoa, with a touch of coffee and vanilla. I am feeling darned pleased with myself, “chuffed”, as my Scottish cousins would say, feeling like I have invented something which probably already exists. I think I will be keeping a freezer bag of frozen ganache blobs on hand for making this drink, and I think I will serve it with a cinnamon stick inserted down the side of the cup, to cut a little of the sweetness. I have a feeling my elder son (the milk chocolate lover) will really like it. And after school, as they breeze in the door with red cheeks and noses, they are absolutely delighted to dive in to the pile of marshmallows and a cup of dark rich chocolate. A simple but special tonic for a cold day.